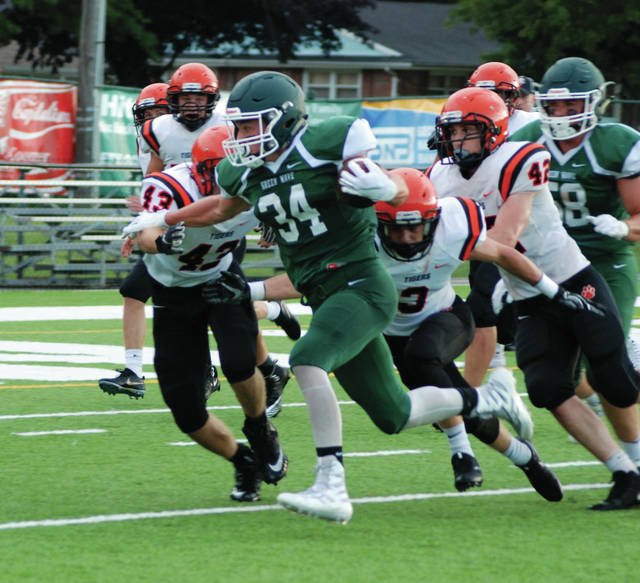 Greenville’s Landon Eldridge (34) gets free around the left side for some yardage on Friday night against Versailles in the last scrimmage game for both teams. Greenville’s Dru Quinn (50) tries to bring down Versailles running back Jake Poling (6) from behind during the two teams scrimmage game on Friday night. 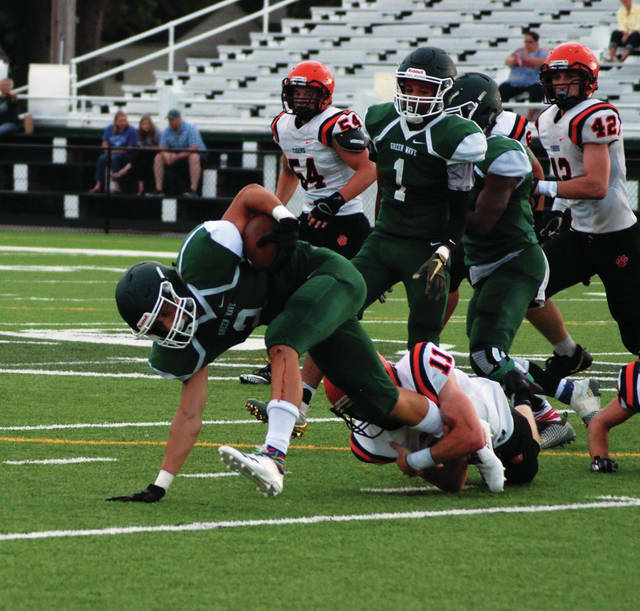 Greenville’s John Butsch (2) tries to get away from Versailles tackler Ryan Martin (11) on the ground during the final scrimmage game for both teams on Friday night. 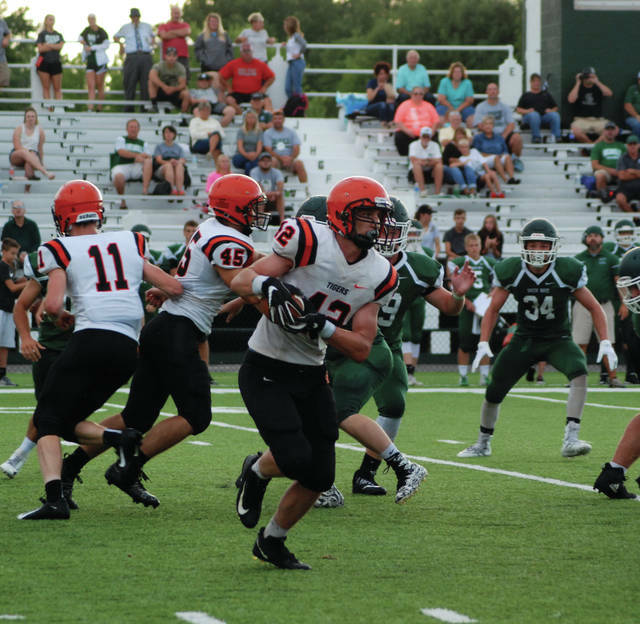 Derek Cavin (42) runs to the right side for Versailles during a scrimmage game at Greenville on Friday night. Versailles’ Andrew DeMange (3) gets shoved out of bounds by a Greenville defender during their scrimmage game on Friday night. Ryan Martin (11) looks to get across the goal line for a Versailles touchdown in a scrimmage game at Greenville on Friday night. 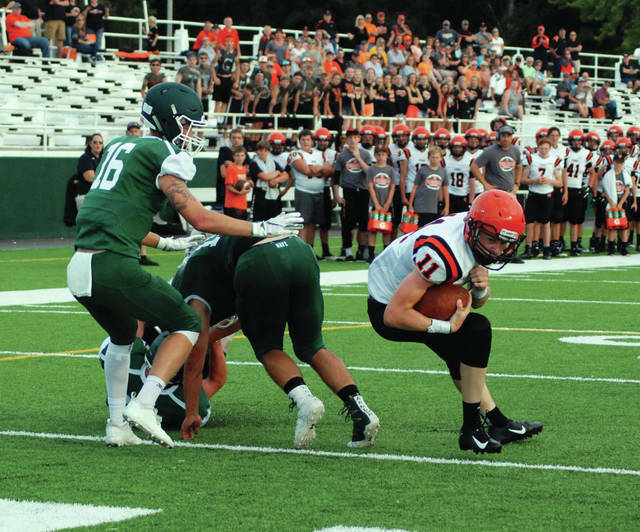 GREENVILLE – The Greenville and Versailles football teams battled on the turf at Harmon field Friday night. The three quarter scrimmage was the final tune up before the regular season starts next Friday. The teams battled to a 14-14 tie at the end of the varsity portion. The JV portion was cut short due to lightning. Versailles scored in the first quarter on a quarterback run with 7:11 left in the first quarter. The Tigers drive started slow with two false start penalties. The Tigers got on track with a pass to the Wave 37-yard line. From there the ground game finished the drive. The Wave wasted little time tying the game scoring with 4:11 left in the first quarter. A 40-yard pass took them to the Tiger 18-yard line setting up a 2-yard touchdown run. With the extra point the teams were tied 7-7. The Tigers threw and interception on their next possession. Greenville started at their own 33-yard line and was moving the ball before a fumble stalled their drive. The Tigers could not capitalize as another interception ended the drive. Greenville’s next possession ended on the Tiger 40-yard line with a punt. The Tigers would give the ball back to Greenville with a third interception. Greenville returned the favor giving the Tigers the ball at the Waves 38-yard line. The Tigers scored with 54 seconds left in the half on a fourth down pass. Greenville received the second half kick and was able to run up the middle for big gains. The Wave scored on a 27-yard touchdown run using only 2:24 to tie the game. The Tigers fumbled at their own 21-yard line on the next possession. 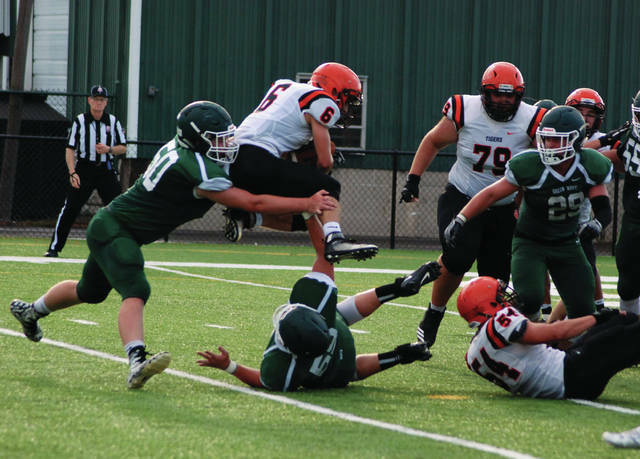 Greenville was unable to capitalize as the Tigers blocked a field goal. Greenville had one last chance to pull out the victory, but a fumble and midair recovery at the Tiger 2-yard line ended the possession. Both teams open the regular season on the road this Friday. 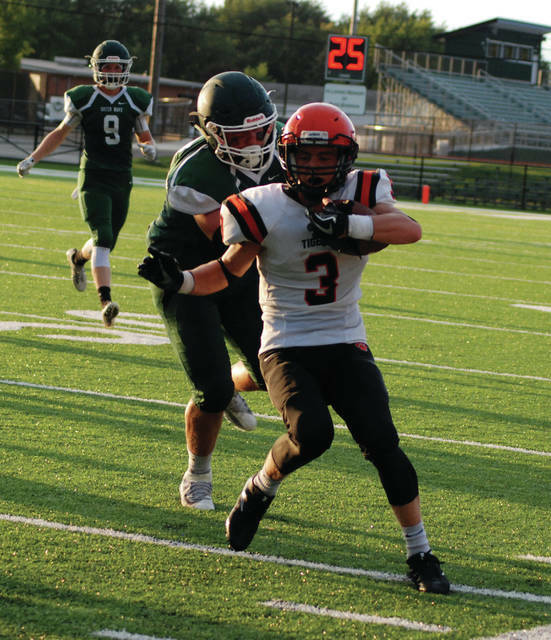 Greenville travels south to Eaton, while Versailles heads north to Celina. This entry was tagged Aaron Shaffer, Adam Miller, Greenville Green Wave, GWOC, High school football, MAC, Versailles Tigers. Bookmark the permalink.